As a non-coffee drinker, my favourite part of the chilly season is to sip on a delicious cup of hot apple cider. It is the perfect winter drink in my opinion! It makes your feel all warm and fuzzy inside, just like when you’re sitting next to a loved one in front of a fire in the middle of winter. 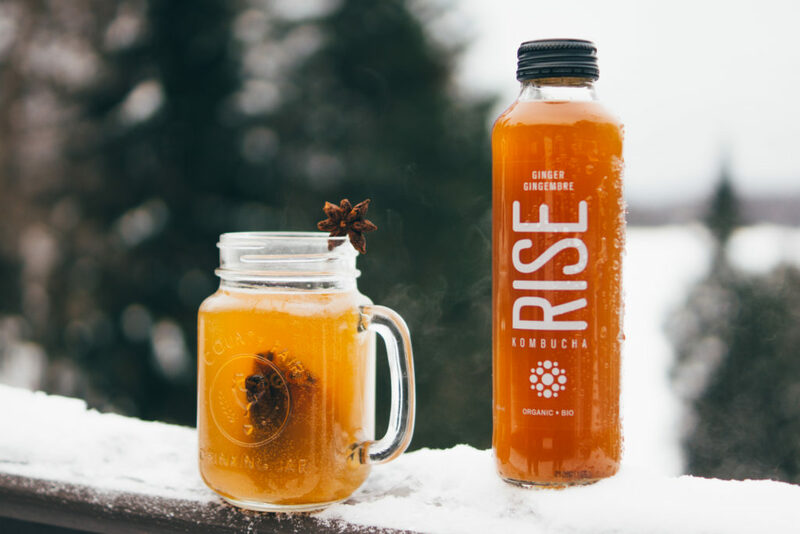 * RISE Kombucha’s Ginger flavour is zesty and can be spicy for some people. If that’s the case for you, reduce the cinnamon and orange zests to half. If you followed the entire recipe and find it too tart, add a tablespoon or 2 of maple syrup. Combine all spices on a cheesecloth and fold up the sides with a string. Boil the RISE Kombucha and apple juice with the bundle of spices. Once boiled, reduce the heat and let it simmer for 10 minutes. Garnish with cinnamon sticks and indulge in this aromatic hot apple cider!